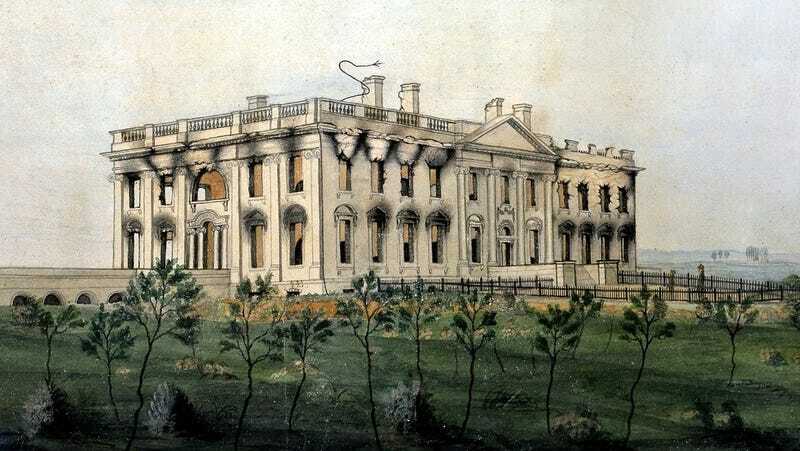 This month is the 200th anniversary of the British capture of Washington, DC, and the torching of the White House. How did this disaster happen, despite ample warnings? A CIA analyst who pored through historical documents blames the same types of intelligence failures that preceded Pearl Harbor and September 11th. The British invasion of Washington, DC, on August 24, 1814, was a surprise attack that shouldn't have been a surprise. The two nations were in a state of war; Britain's defeat of Napoleon in 1814 allowed it to commit its military entirely to its campaign against the U.S., and, most importantly, the British had landed forces that were within striking distance of America's capital city. The capture of Washington, DC, wasn't just a defeat for the U.S.; it was, in retrospect, an embarrassing failure. So why doesn't August 24th have a place in our memories similar to December 7th . . . or now September 11th? It's partly, I think, because the casualties on both sides were relatively light, because the attack didn't lead to anything worse, and because it was quickly overshadowed by Andrew Jackson's decisive defeat of the British at the Battle of New Orleans in early 1815. Yet another reason is that the invasion came at the end of the war, not at its beginning: peace negotiations had been underway for several months, and on Christmas Eve 1814, they produced the Treaty of Ghent, which acknowledged victory for neither side but simply restored the status quo. But Gaddis' historical comparisons raise an intriguing question: Did intelligence failures, such as those preceding Pearl Harbor and the September 11th terrorist attacks, contribute to the U.S. failure in 1814 to anticipate and prepare for the British onslaught? CIA analyst William Weber addresses this very question in a study published in the most recent issue of Studies In Intelligence. Although this is the internal journal of the CIA, a few articles from each edition are unclassified and made available to the public. In the case of Pearl Harbor, Navy and Army commanders in Washington sent out on 27 November separate alerts to all US commanders in the Pacific, but this did not prompt those at Pearl Harbor to put their forces on high alert and order active patrolling. Similarly, three weeks before the 9/11 attacks, an article in the President's Daily Brief, "Bin Laden Determined to Strike in US," provided a general warning but lacked specifics on the time, place, and methods of attack. The U.S. failures in 1814 were even more egregious, Weber argues, since President James Madison, unlike his successors in 1941 and 2001, was aware of both the size and direction of the enemy force approaching the U.S. The British, however, proved themselves adept at erecting Barriers to Perception, which, in turn, led to false U.S. assumptions concerning British intentions that led to one error after another….a cascading failure of imagination. The British also planned two operations disguising their invasion's ultimate objective. A squadron led by Captain James Gordon would create a diversion up the Potomac, attacking any fortifications along the river and threatening Alexandria, Virginia, and Washington from the south. A second feint up the Chesapeake Bay under Captain Peter Parker hoped to draw troops away from Washington by conducting raids and threatening to disrupt communications between Baltimore and Philadelphia. These actions successfully confused the perceptions and thinking of U.S. officials. Francis Scott Key, who served in the DC militia, wrote a reassuring note to his mother telling her the British "have now gone down the river—and nobody seems to think there is any chance of their coming back again, at least, while the [U.S.] troops are in the neighborhood." In fact, even as the U.S. Secretary of the Navy warned that the British might march on Washington, DC, his views were dismissed by other members of Madison's administration. Secretary of War Armstrong, however, doubted an attack on Washington would take place. "Why the devil would they come here?" he declared, pointing to Baltimore as a more lucrative target. Winder, meanwhile, mused that the British would march to capture Annapolis, whose harbor would serve as a base for attacking Baltimore or Washington. He also insisted that the British army had "no object" other than Barney's flotilla, and in the un- likely event they moved on Washing- ton, the invading force was so weak it would accomplish nothing more than "a mere Cossack hurrah." British movements after landing subsequently clouded US perceptions of their intentions. The initial march from Benedict via Nottingham and Upper Marlboro to Pigs Point gave the Americans reason to hope that the British objective was only to destroy Barney's gunboats. ….Maj. Gen. Robert Ross feinted south toward the bridge crossing the lower Potomac—keeping the Americans from discerning his true objective—before reversing direction toward Bladensburg…. As British forces approached, the U.S. assembled a militia that outnumbered the invading army. But, here too, misjudgment came into play. The Secretary of the Navy predicted victory based upon the superior U.S. numbers: "Our force is fast accumulating and we shall now retard and ultimately repel if not destroy the forces of the enemy whose numbers are various estimated but I believe does not exceed at most 5,000." The Secretary of War, however, on the very day of the battle, had doubts that a militia, despite its numbers, would be a match for a professional military. He was correct. The British infantry attacked, supported by Congreve rockets which, while inaccurate, terrified the militia. The U.S. force was ordered to retreat, without a shot being fired. My husband left me yesterday morning to join General Winder . . . I have since received two dispatches from him, written with a pencil. The last is alarming, because he desires that I should be ready at a moment's warning to enter my carriage, and leave the city; that the enemy seemed stronger than had at first been reported, and it might happen that they would reach the city with the intention of destroying it. Could history have gone differently? Weber argues that there were several opportunities to assess the situation and prepare for the worst-case scenario. Although the British hid their true intentions, U.S. officials had made a classic mistake by attempting to precisely predict their adversary's objectives. In doing so, the U.S. ignored the more important issue: How the capabilities of their adversary could enable them to pursue multiple, potential objectives. The British force at Benedict was large enough to operate for several days, and possibly weeks, against a range of targets, including Commodore Barney's gunboat flotilla, nearby towns, and possibly Annapolis, Baltimore, or Washington. Attacks on any of these objectives would be consistent with London's strategy of drawing U.S. forces away from Canada and conducting punitive raids to weaken public support for the war. No commission was ever convened to study the intelligence failures surrounding the British capture of Washington, DC.